It’s never too late to become the person you want to be. 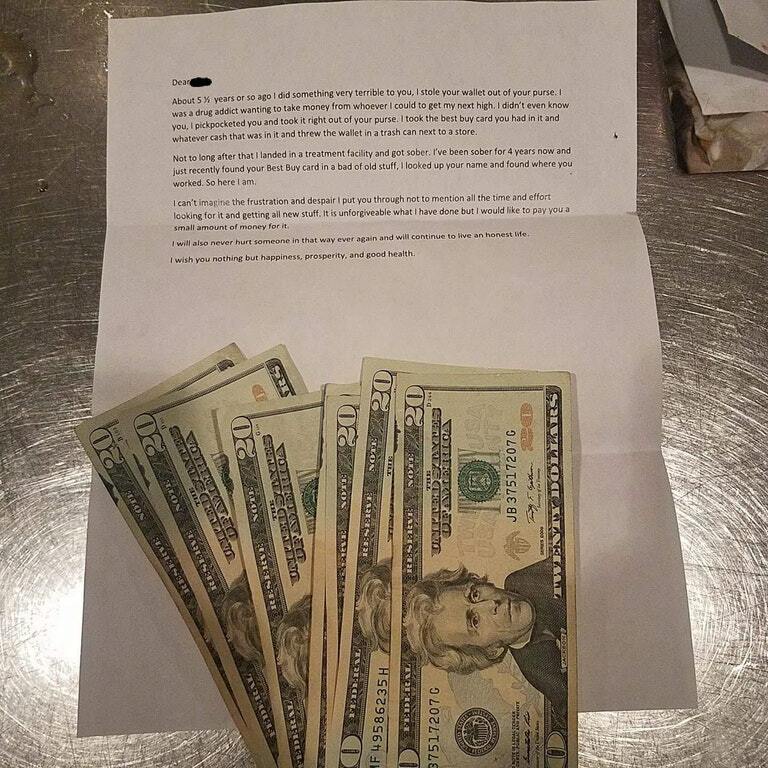 A photo of a letter from an ex-drug-addict to a woman he robbed in the past has gone viral on social media for all the right reasons. “About 5 1/2 years or so ago I did something very terrible to you, I stole your wallet out of your purse. I was a drug addict wanting to take money from whoever I could to get my next high. I didn’t even know you, I pickpocketed you and took it right out of your purse. I took the Best Buy card you had in it and whatever cash that was in it and threw the wallet in a trash can next to a store. Not too long after that I landed in a treatment facility and got sober. I’ve been sober for 4 years now and just recently found your Best Buy card in a bag of old stuff, I looked up your name and found where you worked. So here I am. I can’t imagine the frustration and despair I put your through not to mention all the time and effort looking for it and getting all new stuff. It is unforgivable what I have done but I would like to pay you a small amount of money for it. I will also never hurt someone in a way ever again and will continue to live an honest life.